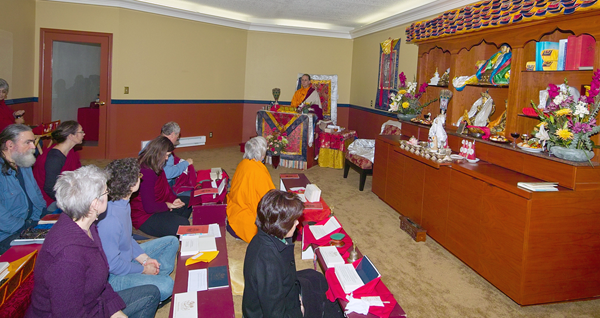 The members of Chagdud Gonpa Amrita practicing in the Shrine Room. Chagdud Gonpa Amrita is one of the many centers established by His Eminence Chagdud Tulku Rinpoche (1930-2002), a meditation master of the Nyingma lineage of Tibetan Buddhism. Membership pledges directly support our ongoing operation costs, such as rent, utilities, and office expenses, as well as maintain a financial stability that allows us to offer our events at a low cost and provide a generous sponsorship program. In becoming a member of Chagdud Gonpa Amrita, you automatically become a member of Chagdud Gonpa Foundation and become part of the spiritual activities of the Chagdud Gonpa centers throughout North and South America and Asia. In addition to the merit of supporting the Buddhadharma, you will enjoy a members discount at Amrita events and 10% discount on purchases from Tibetan Treasures. Your membership pledges are tax-deductible. To become a member, please click the link below that will take you to our secured Wild Apricot membership site. For your convenience, you will be able to create an account and manage your own membership online.